There are several news stories unfolding right now that are of interest. 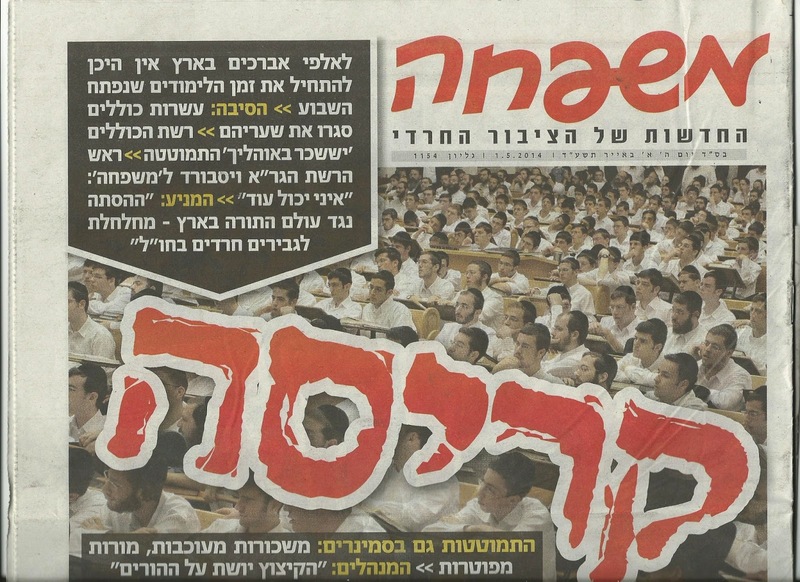 The Jewish Worker reports on how the Israeli Mishpachah newspaper has a banner headline screaming about the financial collapse of charedi kollel society. The newspaper states that the cause is rich American charedi donors having been negatively influenced by the incitement against charedim in Israel. That's odd, I thought that the cause was that charedim in kollel are not working. And why is there any blame to be attached to Americans? Could it not be that the Americans just don't see why they should be bailing out a society that is obviously unsustainable? What is Mishpachah's plan for a society with a very high rate of unemployment that is constantly increasing in size? Meanwhile, here in Beit Shemesh, re-elected mayor Abutbul continues to disappoint. The municipality did not give its customary financial aid to the communal Ethiopian seders. There are allegations that this is due to the Ethiopians having strongly supported Abutbul's nemesis Eli Cohen. Instead, the Anglo dati-leumi community contributed most of the funds, and Rabbi Dov Lipman asked Yair Lapid if the Finance Ministry could make up the remainder. Lapid gave the money from his personal account! To quote Michael Lipkin in The Times of Israel: "So, just to spell out it out, when our mayor, the vanguard of Torah in Beit Shemesh, has the first opportunity of his new term to do something truly religiously significant he strikes out and abdicates this, small but important, task to the “devil” himself, Yair Lapid. You can’t make this stuff up!" There's another fiasco unfolding that involves our mayor. For the Yom Ha-Atzma'ut celebrations, the municipality invited (at a cost of 127,000 shekels) singer Eyal Golan. But Golan has been embroiled in a scandal involving charges of taking advantage of young girls. While the formal charges were dropped, there's enough residue, as well as acts to which he admitted, that make him a highly inappropriate choice. The dati-leumi rabbonim (but no charedi rabbonim) sent a joint letter of protest to the mayor, which he rejected, and none of the solidly charedi municipal coalition appears to oppose it. It's truly remarkable that the electoral campaigns of the mayor and these parties was based on the claim that only charedim would ensure the sanctity of the city. Nothing to say about the soldier who was reprimanded for pointing his weapon at some arabs in hevron who were attacking him? I hear it's causing a stir. The idf's laws handcuffing Jewish soldiers are surely not rational. Does no one actually read the news? He was charged for attacking his officer. Nothing to do with that incident. The "article" / blogpost is about several current news events in Israel. Rabbi Slifkin frequently opines about Jewish involvement in the Idf, and his site is rationally inclined, so I simply ask when will be the time that he will discuss or address the very irrational politicized policies of the IDF which put our men in harms way and unnecessarily risk their lives to protect our enemies. Add to this the fact that these policies exist in the name of some ephemeral "moral code", it seems like something germane to this blog. Could it not be that the rich Americans just don't see why they should be bailing out a society that is obviously unsustainable? My guess is that they simply don't have the means to fund the people here. Why is inviting a singer who's charged have been dropped an issue? If its an issue then they can just arrest anyone they don't like to ruin their reputation. Its like nitpicking anything possibly, remotely problematic with Haredim and the candidate you did not want to win. He wont the election get over it or just move on, literally to a new location that will suit your political views and such. The issue is that Golan - a hiloni with a penchant for sexualised songs - aside from the controversy - is a rather strange and 'ahem' unorthodox candidate to be promoted by a council who literally professes to represent Hashem's word and who vilified opponents as enemies of Torah. But I guess there's no way pleasing some people if you're Chareidi. You or they (by default I assume you) seem to miss the point of the Torah. None of the Prophets should have bothered - they were preaching to people not medakdek in Halacha anyway! Your definition of areivus means only taking responsibility for people who already take responsibility for themselves! You should know better, It's that kind of condescending comments that make people look down on Chareidim to begin with. Your whole comment is written in an attacking way. Firstly, to call all Chilonim immoral is disgusting. You can be a Chiloni with alot more morals than a Chareidi. Keeping the nuances of the mitzvos but ignoring the mitzvos bein adam l'chaveiro does not give you a higher moral standing to judge others. It is for Hashem to judge people. Secondly, we don't have to heap praise on the mayor of 'Beit Shemesh' for his "tolerance" in allowing a concert that the Chareidim won't participate in. Do we thank the mayor of Yerushalayim who is not Chareidi for tolerating the Chareidim to have Chareidi events in the city(gerrer wedding, simchas beis hashoevas, etc,). Does that mean the mayor of Yerushalayim can choose the form of entertainment the Chareidim must have in their celebrations because he was so tolerant in allowing it? The mayor is not a dictator, he has to allow all segments of the population to freely celebrate their holidays and simchas. "The Chareidi people do not go against Halacha with live music concerts during sefira. " I challenge you to point out a single halakhic source that live music is forbidden during sefirah. Weddings and shaving (etc.) are forbidden. Period. I do wonder if they invited Golan davka to torpedo the whole thing, knowing religious people wouldn't like it. Nachum: You wonder? Of course that's why they did it. If you need any proof, the latest development is that the mayor has threatened to withhold funding for the RBS Yom Ha'atzmaut celebration unless the two longtime organizers, who have already done all the work (and who happen to be DL), are booted from the committee that is in charge of the celebrations. As someone else wrote on the topic, the mayor obviously hasn't heard of the mitzvot of Lo Tikom Velo Titor. so, if you're trying to be clever, try again. as to your last point about the critic being "motsey shame ra" on secular music stars by stating that they all engage in conduct that the torah condemns, if you really think that was made up, then you too are very naive. the torah commands us to be dan lkaf zchut for some one who has a "chezkat kashrut", not to deny obvious facts that are well documented and freely admitted to by the involved parties. Regarding the Chareidi Hesder Yeshiva, interesting but why recruit boys at the age of 18? I read the interview. Rav Gross says the boys are highly motivated and work hard. I believe him. But if so, they should be in Yeshiva Gedolah for a minimum of 2 years. This should be a requirement. That's much more palatable than going straight from yeshiva high school to chareidi hesder. Even in the States, most Yeshivos that allow the boys to attend evening college courses don't allow it from day one. First spend some time in yeshiva and then whoever wants can go to night classes. Should be the same here. It is for the reason you stated that all the Hesder Yeshivot have the boys first study Torah for an extended period (I am not sure how long but it is more than a year) before beginning military training. Thus, there is no problem going straight to Hesder after finishing yeshiva high school . Although this Haredi Hesder idea sound like a good one to many of us, I was under the impression that the Haredi leadership was strongly opposed to the idea of any joint Torah-Yeshiva program mixed with anything else. This includes Torah u'madah (Torah and science-e.g. Yeshiva University), or Torah Im Derech Eretz (Torah and secular education in the same institution) or Hesder (Torah and military service). In other words, if someone didn't want to study Torah full-time, he should just go to the IDF, or if he wants to study secular subjects, he should do it at night in some other institution....you don't mix the Torah with anything else in the same institution, because, according to this way of thinking, Torah is just "another subject" of no more than equal importance as the other thing that is being associated with it.. This is what lead to the break-off of Yeshivat Har HaMor from Mercaz HaRav in the DL world, Rav Tau objected to Mercaz HaRav giving teaching degrees as part of the yeshiva program. Thus, a Haredi boy who didn't want to study full-time would (b'di-iavad) be told to go to Nahal Haredi, not a Haredi Hesder program, as I understand it. It seems from the TOI blog that the Beit Shemesh Anglos contributed about 1/3. The Lapids contributed about 2/3. By any standards (and certainly those supporting Kollel funding) this is a tremendous credit to the Lapids. "At the end of the four-year program, the graduates are not only accomplished yeshivah students..." No yeshivah can be certain of how their graduates will turn out. This should have been phrased as a hope rather than a statement of fact. That having been said, I share Rabbi Gross' hope. don't get why Jews should live under such Socialism! The government should take less taxes and leave the spending to the people themselves. Get off the addiction of a nany state. Cut the funding all around. Cut it to things like these Seders, to many of the Colleges and "art" and sports stadiums etc. CUT CUT CUT CUT CUT and keep the government out! And, especially, cut all funding to the charedim who don't believe in the State in the first place. 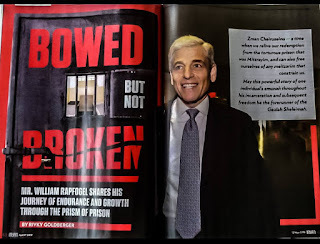 And for all those naive people out there (or not so naive people), there you go - Lapid IS connected to Bet Shemesh politics. And all the protestations during the recent elections to otherwise are now blown to bits. So now you actually have to reasses - did you really want a mayor connected to this guy? Um, as finance minister he's "connected" to every city. But you know that. Besides this is just a nonsensical straw man as the foolish fibbers who mugged for Abutbol were claiming that Lapid was "pulling the strings". What people like you don't get is how terrific it is that we have our own MK who can just pick up the phone and make a call like that... correcting the malicious political payback of our despicable mayor. The definition of despicable is deserving hatred and contempt. I thought we shouldnt hate our fellow Jew? If it's OK for Baba Sali to marry a 15 year old why isn't it OK for Golan? If anything, I think a 15 year old chiloni girl nothing better what she is doing than a 15 year old orthodox girl. These people have beleif systems that you and I don't share but on their own terms they may not be so terrible. Most 15 year olds in Tel Aviv are sexual active, you know. Personally, I equally despise the Babot and the Israeli singers and think that they have a twisted morality. I don't listen to Carelbach because I find accusations of sexual misconduct against him quite credible. So whom can one listen to? I love ZAZ. It is Motzi Shem Ra on Chiloni society to state that they did not find this horrible. They did. The question was not how the 15 yo's are acting, we all know what 15 yo girls do, even in Israel, but in how the adults in the story took no responsibility for their actions. The singer himself claims that he did not know that they were underage. The person who recruited them was Eyal Golan's father, and yes, he did know. Ish ve'Aviv yelchu el HaNeara (Amos 2). It was repulsive and counter to all Jewish values, including Chiloni Jewish values. So which city hires him for their Yom Ha'atzmaut concert? Beit Shemesh, ir hakodesh. Oy vey. 1) Chareidim don't follow these stories anyway. This singer, that singer, they all act like that. 2) Chareidim believe that all chilonim are equally immoral and do not care..
And why DL would protest: because we do not believe either of those statements. Not all singers are immoral. The ethics and values of Israelis are for the most part, based in Torah, even when they don't realize it. Otherwise, basic Derech Eretz Kadma LaTorah. So no, they are not all immoral. "Most 15 year olds in Tel Aviv are sexual active, you know." 3. They were hoping this would happen. If it's OK for Baba Sali to marry a 15 year old why isn't it OK for Golan? In pre industrial revolution days, marrying 13 to 16 yr olds was the norm. And the industrial revolution didnt reach morroco in the days of the baba sali. 2. Perhaps the industrial revolution didnt reach(the abutbol side of) bet shemesh yet..
1. Yes, many chiloni disapprove of Golan's behaviour. It's to their credit, but in terms of their society's values it's irrational. Are you people comatose? You don't see crowds of young girls following these menuvolim singers and shouting תעשה לי ילד? 2. Charedim follow chiloni gossip a they generally know Golan's story. Let them explain why they hired Golan. I don't know. I think Berland is a worse מנובל than Golan but I haven't heard any official condemnation. 3. My clueless chiloni relatives ask me if my teenage kids are sexually active, their's are. According to a census conducted among 10th graders in 2012 18.5% said they were sexually active. From knowing Tel Aviv I think more than 50% would be about right. In their culture it's to be expected. 4. The story on the charedi steet is that when Baba Sali married his last wife when she was 15, it was to save her from dying from a terminal illness. The only way to save her was with the merit of marring a Zadok. I understand that in terms of the Arab culture of Baba Sali it wasn't a problem. Also I understand that halachikly it was not a problem. However, I think that it's moraly wrong and would have liked the State of Israel to prosecute him. T-Mobile. America's First Nationwide 4G Network. I think that the mayor is just being consistent with the "famous singer". After all everyone knows that he would probably never dis-invite from any public event, the famous charedi "shiny shoe music" singer who had a thing for underage women. You know..the one who swallowed the camera memory card. I've always felt like American Charedi philanthropists are actually hurting the Charedi community by allowing the kollel system to get bigger and bigger before the inevitable collapse. I'm not sure what's going to happen now that the money is starting to dry up, but almost anything seems better than the status quo. Maybe it will even lead to the restoration of the traditional Jewish practices of giving our sons (and not just our daughters) the education they need to earn parnassah for their families. "Maybe it will even lead to the restoration of the traditional Jewish practices of giving our sons (and not just our daughters) the education they need to earn parnassah for their families." Speaking of which, how are we not posel every ketubah of lifetime avreichim? It's a complete sheker. "Be my wife, and I will feed/clothe/provide for you" - Maybe wives should be giving the ketubah to the husbands!